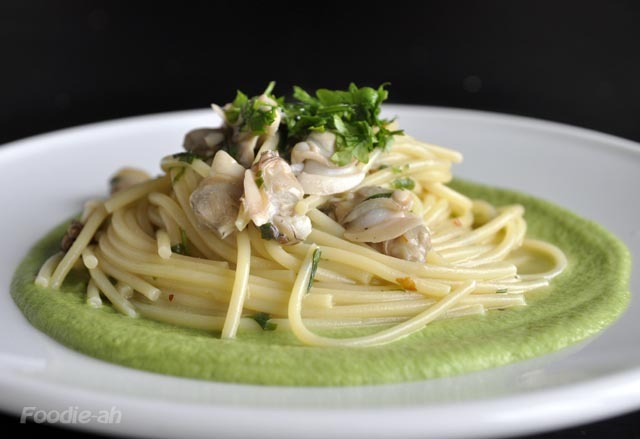 Spaghetti alle vongole (clams) is an Italian classic. This is a variation to the standard version of this popular dish, which includes the mild flavour of broccoli to achieve a creamier, smoother result. Local clams (pictured below) which you can find in any Cold Storage will work just fine although they are not as tasty as Mediterranean clams. Avoid using cockles for this dish, as they have too strong a flavour and they won't give you the same balanced type of result. The spirit of this cooking technique is to retain as much of the taste of the broccoli and clams as possible, by reusing the same boiling water to boil the spaghetti. Separate the stems of the parsley from the leaves, chop the leaves coarsely and keep the stems. Wash the clams, peel a couple of cloves of garlic and squash them a bit. Fry the garlic cloves in abundant olive oil on a large frying pan, then remove it from the oil. Sprinkle some chilli flakes to taste, then add the clams and cover for a few seconds. Open up again and pour some dry white wine. Make sure that the oil is hot enough when you do that, to allow the wine to evaporate quickly. Cover again and remove from the heat once all the clams are open. 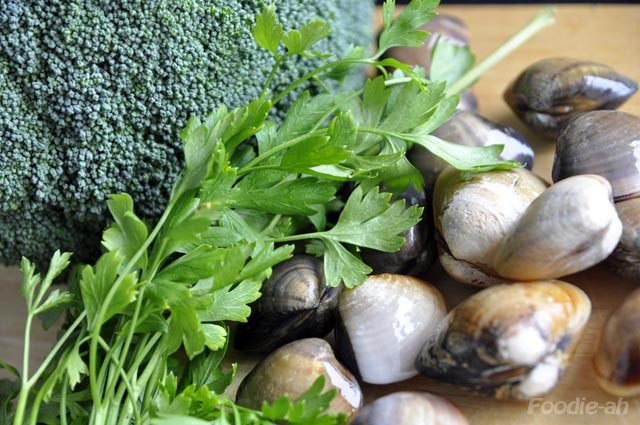 Separate the clams from the juice, discard the parsley stems and remove the edible part of the clams. Bring a pot of water to the boil and cook the broccoli in it for a minute or so, until tender. 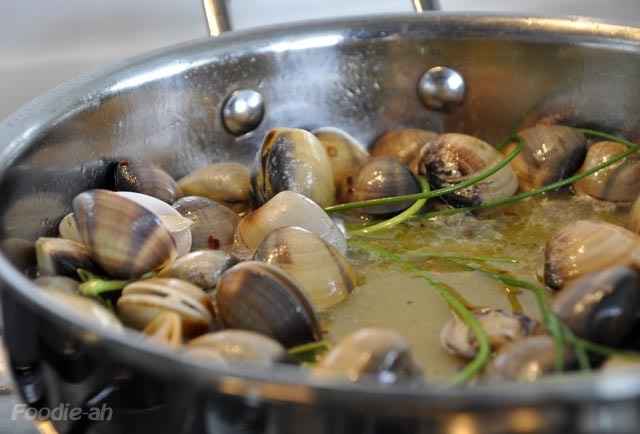 Remove them from the water, and then put all the shells into the same pot, which you will later use to boil the pasta. With an immersion blender, reduce the broccoli into a smooth cream together with 1 anchovy and some salt. Add some of the boiling water as necessary to get the cream to the right consistency. Remove the shells from the pot (after a few minutes, once you are done with the broccoli cream), and boil the pasta in the same water. Reheat the clams juice on the same frying pan you used to cook them, drain the spaghetti a minute earlier than their normal cooking time and put them into the pan. Add salt and chopped parsley and let the pasta absorb the sauce, while topping up with some of the boiling water if they start to get too dry. Finish with some freshly ground pepper and the clams. Serve on a plate with the broccoli cream spread at the bottom and decorate with parsley.